Scientists and engineers at BAE Systems have provided details on future tech concepts they expect to see in our military in 25 years time. Experts at BAE Systems' Research and Development team at Warton have lifted the lid on four futuristic technologies that could be incorporated in military and civil aircraft over the next quarter century. 3D printing unsurprisingly makes the cut. The tech is currently used for many things in the commercial sector but BAE reckons the armed forces will have a use for it too. Specifically, what it calls 'on-board 3D printing'. According to BAE, in a disaster scenario an aircraft could report back to mission control and receive engineering data on the types of supporting UAVs (unmanned aerial vehicles) required for rescue or surveillence. Said drones could then be printed and deployed from the aircraft. Next up, the Michael Bay-baiting "Transformer". Essentially, an aircraft made up of smaller sub-aircraft that save time and fuel by travelling together and, once threatened, split apart and act independently. Third in the list are 'Directed Energy Systems'; a futuristic attachment weapon for aircraft capable of firing a concentrated beam of energy at the speed of light. So far, so Star Wars, right? The thinking is that the system can be used to protect ground troops from incoming projectiles such as missiles or mortars. 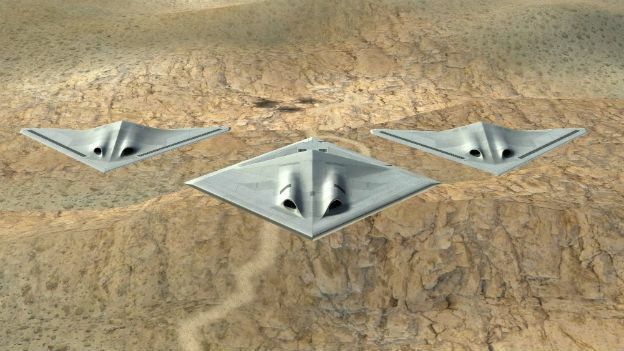 BAE Systems says that in the future, these could be adapted into an attachment for aircraft, taking that capability to the air. The fourth concept explored is the 'Survivor'; a technology that uses nanotechnology to let jets to heal themselves from damage sustained in flight. It works through a lightweight adhesive fluid inside a pattern of carbon nanotubes (from which the aircraft is constructed) that is released when the plane is damaged to quickly 'set' it mid-flight. Like super-gluing a Eurofighter back together again. Nick Colosimo, a futurist and engineering manager within the R&D team at BAE said: "Of course we don't know exactly what sorts of aircraft technologies will be used in 2040 with any certainty, but it's great to be able to show the public some concepts that might be possible through projecting where today's technology could get to." Video animations of the four different concepts can all be found on BAE's YouTube channel.